Candor International School was launched in August 2011, nestled in 25 acres of prime land in the south of Bangalore, between Bannerghatta and Electronics City. The location allows for easy access to popular residential areas while at the same time maintaining an atmosphere of serenity and calm. Candor’s grounds are home to state-of-the-art academic, sports, arts, music and tech-enabled classroom facilities, emphasizing its commitment to academic and holistic education excellence. Candor also houses two boarding facilities to cater to students who wish to stay on campus. Candor International School offers an international education that prepares our students for an ever-smaller world. Consequently, we offer purely international syllabi. Candor’s credentials include authorization to deliver both the International Baccalaureate program (for Grades 1 to 5 and Grades 11 to 12) and the Cambridge curricula (for Grades 6 to 12) . We also firmly support a holistic approach to education. To succeed in the uncertain world of tomorrow, a multi-dimensional approach to education is required to upskill and prepare students for tomorrow’s challenges. Thus, Candor International School encourages learning beyond what is provided in a textbook, in both our students and teachers. At Candor, we emphasise skill-based learning, cognitive thinking, ethical behaviour, moral integrity, experiential learning, leadership and individuality. Our concern for climate change and global warming is a cause close to our hearts. We are proud to have been certified in 2014 as the first Green School in India. From the architecture, landscaping, energy consumption and even how we source food – Candor leads in a sustainable built environment. Our approach and core values attract a number of different students from the US to Australia, and we have over 18 different nationalities represented across our students and staff on the expansive 101,000 m² campus. The school is founded by Dr. Suresh Reddy, our passionate Chairperson who believes today’s children deserve an international education rooted strongly in the values of community involvement and environmental activism. 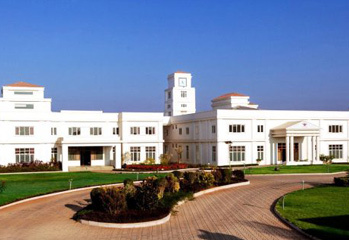 Candor International School is the unique result of Dr. Reddy’s extensive international experience, desire for accessible world-class education, and a value-based school system. Dr. Reddy has also received an honorary degree in 21st Century Building from Keisei University (South Korea) in December 2017, in recognition of successfully creating an environmentally-friendly green school.